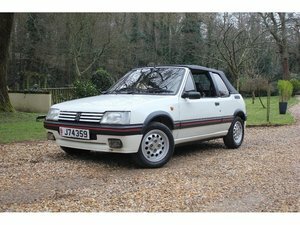 FOR SALE: The earliest known 1.9 GTI in existence, reg'd 2nd Jan 1987, 2 owners from new and 92k miles. EQUIPMENT Two spoke leather-trimmed steering wheel, Electric windows, Sunroof, Digital clock, Yellow front fog lights, Heated rear window, Locking petrol cap, Cigarette lighter, Ashtray, Philips cassette radio, Lockable glovebox, Interior light, Spare wheel. EXTERIOR As one of the earliest registered 1.9 GTIs this example looks superb in its Graphite Grey paintwork, which is perhaps the best colour for a 205 of this vintage. The bodywork is to a presentable standard overall with some light age-related blemishes to be found. Looking closer the car remains straight along both sides, and there are no unsightly scrapes to report on the bumpers. The trim throughout remains in decent condition, and all the lenses are clear and moisture-free. Most importantly this one's an excellent driver, although it would benefit from some fettling by the new keeper to get it spot on. INTERIOR The interior space presents in lovely original condition. The half leather seats are showing some usual signs of age to the bolsters however all the cloth centres are tight and free from any damage. As an early phase I GTI this example sports the original style dashboard and the desirable two-spoke leather steering wheel. Pleasingly, a period-correct Phillips cassette stereo is also retained. ENGINE & TRANSMISSION On test the 1.9-litre engine performs well, idling up to temperature correctly and pulling through the gears with ease. Most recently it has received an oil and filter change in June 2018. The characteristic 205 gearbox still feels superb to operate with no issues upon inspection. WHEELS, TYRES & BRAKES Filling the arches are 16-inch alloy wheels that display only very minor age-related wear. The alloys are shod in quality Goodyear and Falken tyres, each with a good amount of tread remaining. Out on the road the brakes do a good job of stopping the car quickly and in a straight line, with the discs and pads still showing plenty of meat left. HISTORY FILE This cracking little Peugeot was first registered on the 2nd of January 1987. 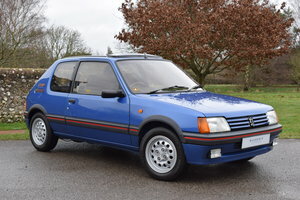 As such, this car is understood to be the earliest right-hand drive 1.9 GTI in existence, as confirmed by the Peugeot Sport Club. Amazingly it has had just one owner for the vast majority of its life; the first keeper sold the car to the current owner way back in 1990. 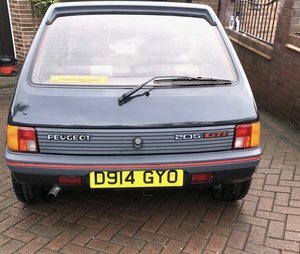 After some time off the road the 205 has recently been to marque specialists Pug Racing for a light mechanical re-commissioning and service. Please visit our website for a full write up and additional photographs. Worldwide shipping is available on request. Tel - 01420 479909 For updates of new stock please join us on Facebook and Instagram. SIMILAR REQUIRED /// Please get in contact if you are thinking of selling a similar classic car. We are always looking for high quality, low mileage classic cars with good service history from the early 1970s to the 2000s. If you are looking to take the hassle out of selling your car privately then please don't hesitate to get in contact. We offer a professional and friendly service with two different sales options detailed below... SALE OR RETURN – This option achieves the best possible price for your car and removes the hassle of having to prepare, advertise, arrange viewings and organise payment with potential buyers. You can rest assured that your car will be pampered in our heated indoor showroom and kept in safe hands during the process. OUTRIGHT PURCHASE – This is a quick and easy way to sell your car. The funds will be securely transferred the same day to your designated bank account.